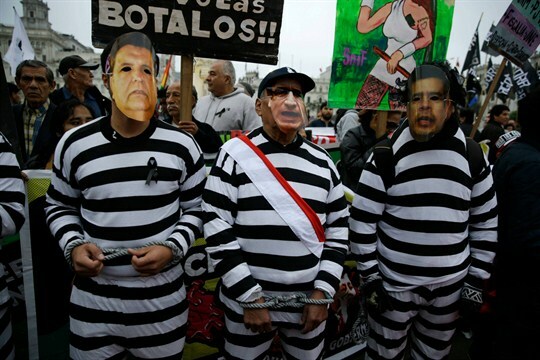 Demonstrators wearing masks with the image of Peru's President Martin Vizcarra, center, former President Alan Garcia, and Congress President Luis Galarreta protest against corruption, in Lima, Peru, on July 27, 2018 (AP photo by Martin Mejia). Peru’s Martin Vizcarra traveled one of the more unlikely paths to the presidency. When he assumed office suddenly and unexpectedly last March, more than 80 percent of Peruvians said they did not recognize his name. As he approaches six months in power, the soft-spoken accidental president is hitting his stride, leading some skeptics to think he has a chance, though no guarantee, of actually completing the three years left in the term of the president he replaced. Some Peruvians now say there’s even a possibility that he will do more than keep the seat warm for his successor, and may just manage to make a significant, positive difference. It all comes down to a single problem at the heart of many of the country’s woes: corruption.